Through the Center for Jewish Leadership and Ideas, directed by Rabbi Shai Held, Hadar teaches growing numbers of Jewish adults, both lay and professional, about finding meaning and inspiration in Jewish texts and tradition. The Center's public events and published writing offer both spiritual nourishment and intellectual challenge. The Center's work is guided by the conviction that Jewish tradition can offer crucial insight into key questions facing the Jewish community and the broader world. Books and Torah Online: Rabbi Shai Held's weekly essays on the Torah (2014, 2015) were read by thousands and his book, Abraham Joshua Heschel: The Call of Transcendence, published in 2013, has been hailed as a "watershed" by scholars in Jewish thought. Evenings of Learning include lectures, classes, and dialogues with influential Jewish leaders and thinkers. 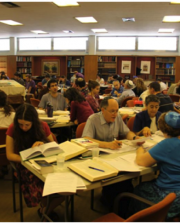 Week-long educational intensives for professionals and laypeople, including a Rabbinic Yeshiva Intensive each winter and an Executive Seminar each summer. Both programs draw participants from across the country and the denominational spectrum. To sample the work of Hadar’s Center for Jewish Leadership & Ideas, subscribe to our podcast here. You can also listen to the sessions at a previous Yom Iyyun, Israel and the Diaspora: Where Do Jews Belong?